Titanium Sublimators - National Electrostatics Corp.
Titanium sublimation pumping is ideal for fast pump down and high loads of chemically active gases. The NEC sublimation system was originally designed to handle applications where active gases were being continuously fed into an ultra-high vacuum system. However, the sublimator cartridges can be cycled repeatedly to handle very high bursts of active gases without requiring standby power. Complete systems are available, which combine the high speed of titanium sublimation with the ability of the sputter ion pump to pump chemically inert gases. NEC can provide sublimation systems utilizing a single cartridge or multi-cartridge arrays in custom vacuum housings, complete with the NEC titanium sublimation power supply. Typically, the sublimators are used in arrays, where multiple cartridges can be used at one time. Switching cartridges is done externally without breaking vacuum. 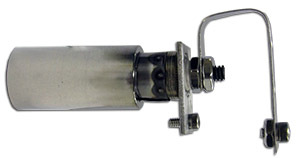 The titanium sublimator cartridge is a simple and dependable two terminal cartridge. It is designed to mount in any orientation on a simple support to allow ease of replacement after the cartridge is expended. The unique design of the cartridges allow a rating of up to 75% usage of the titanium available. Cartridge capacities of 10g, 20g, and 50g are available, with various available lead types for maximum compatibility. Please contact NEC for more information on design options, or advice on which available design would be best suited for your application.